image source: C2C restaurant site. 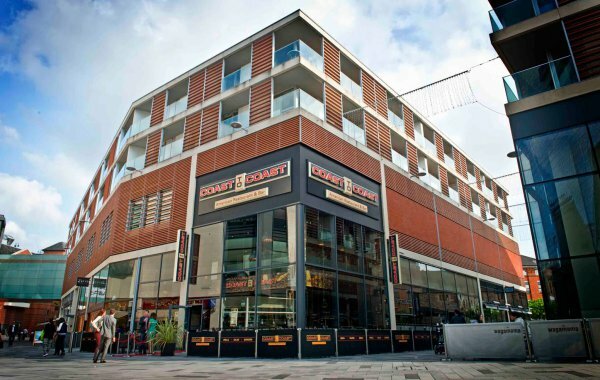 The Highcross Shopping Centre has grew in it's selection of the biggest chain restaurants since it opened back in 2008 and there's something to suit every diner's request. Nestled in amongst these restaurant, opposite the Showcase De Lux Cinema is the American Restaurant, Coast to Coast. Coast to Coast is a restaurant that offers a unique American menu for it's customers to enjoy. I don't remember the last time I actually visited this restaurant since it's opened, it's definitely been a few years, so when I was invited to enjoy some of their food and cocktails before Valentine's I couldn't resist. The decor in the restaurant takes you right to the states, with their artwork dressed on the walls showing the best of the American culture. It's also an impressive spacious restaurant meaning you feel like you have your own area of the restaurant to enjoy your dining experience without feeling like you need to constantly shuffle to and fro for other diners to be able to be seated etc. The restaurant also offers some great deals on food and drink, with a 2 for 1 cocktail offer available too which is an instant winner with me! Our hosts for the evening were great in ensuring we were comfortable and were attentive in all of our requests, they quickly sorted us out with some Pretzels to get the evening started. These were delicious to be dipped into what I thought was melted butter dip that was available. We did presume we were getting the small pretzels you'd get in a bag so wondered why they took a fewer more minutes than we had anticipated before arriving with a fresh batch of large sized pretzels that were still very warm, they were so good. In terms of starters there was a lot of choice on the Coast to Coast menu, they had everything and more that you expect from an American styled restaurant and it was so hard to make a decision. We opted for one of their sharing starters, The BBQ Platter which is perfect if your not sure what you'd like to eat and there's more than one of you dining. The platter came with chicken tenders, delicious hand cut ribs (they were my favourite), American loaded bacon & cheese and cheese & chives skins, which in my own opinion were a bit bland and felt needed more flavour within them. Also there were BBQ chicken wings and tortilla chips topped with salsa and jalapeno cheese sauce. We both felt that the nachos lacked some quantity with cheese sauce and we got less than we expected to on our nachos. The dish is advertised as a BBQ feast for four but quite frankly it's better suited for two people, imagine trying to have one of everything from the platter, difficult decision! Our eyes were definitely bigger than our belly when it came to the main dishes, we definitely should have chosen a smaller starter choice at this point when realising that the starter was a lot more filling than we had anticipated. For our mains we both opted for a simplistic meal choice, Jordan opted for the Chilli Cheese Burger which looked so good. It was a burger with streaky bacon and jalapeno cheese sauce, he mentioned there was a nice kick to the cheese sauce which he enjoyed dipping his chips into! I opted for something I had kind of been craving for a long while and went for the Foot Long Hot Dog, a jumbo roll with a Bockwurst sausage topped with grated cheese, diced bacon and spicy ketchup, finished off with crispy onions and fries. It is a big eat but unfortunately I didn't really enjoy it as much as I had hoped to, I felt like the sausage wasn't really to my taste buds and I would have preferred a better quality sausage in my hot dog. Especially as it came with so many toppings, it felt like the sausage let it down. We didn't manage to finish either of our dishes, we were way too full but the staff quickly ensured we had them in boxes so we could finish them off at home. Sometimes it's quite nice to get back into the comfort of your own home and finish off a meal, especially when there was more room in my stomach to digest more food. Coast to Coast have some really fantastic food offers on during the day and also have an exciting app which you can download onto your smartphone. Once you download the app you get a free cocktail, £10 off your next visit and 25% off food EVERY Tuesday from 5pm. You also have access to a unique menu from the Secret Society, how exciting! I've downloaded one myself so make sure you do, it'd be a great asset for the next date night in your diary. *Restaurant Review. Invited to review Leicester's Coast to Coast restaurant. All photos, views and words are my own.